Hello and welcome! My name is Misty Spears and I am the person behind the screen here at the How to Program with ColdFusion blog. I am currently a Senior ColdFusion Developer at a fantastic company in Augusta, GA. I’ve been programming in ColdFusion since 1997 so I have lots of real world experience under my belt to share with you. 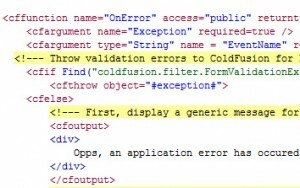 I originally started this blog because I was helping a friend of mine learn ColdFusion and after having written several tutorials for him on the subject I thought there might be others who would find the information useful as well. While my many years of experience in ColdFusion has let me learn some very advanced uses for it, I’m going to focus on those who are just learning the language. My goal is to write tutorials that are written in a way that someone brand new to programming can understand. I will also provide useful information like how to setup ColdFusion, how to administer it and many other important aspects of working with ColdFusion. I will also try and share my opinion on books, online courses or workshops and anything else that might be thrown at me. If you would like to see something that I haven’t covered, just leave me a comment or send me a message to let me know what you’d like to see here. Along with the technical side of programming with ColdFusion, I will also share with you my struggles and thoughts on on my job as a Senior Developer. While learning ColdFusion is the major focus of this blog, it’s important to train your mind to think like a programmer to solve problems that you might encounter at your own job. 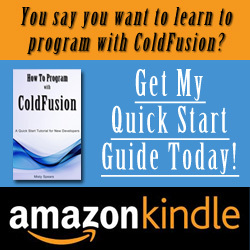 I hope you stick around and decide to make How to Program with ColdFusion your first stop to learning ColdFusion. Let’s get started!